I was here for four days over Aug/Sept 2017 and am now posting my notes in October 2017. Koh Tao is famous as a SCUBA diving island in the Gulf of Thailand. Koh Tao means “Turtle Island” because it was formerly inhabited by turtles. How to get there from Bangkok: I flew into Koh Samui. This is the quickest and maybe most expensive way. I bought a boat ticket at the airport. (Lomprayah boat company, there are 2 or 3 fast ones) Free airport shuttle to the pier, and then 2 hours later I was at Koh Tao. The boat stopped at Koh Phagnan en route. Sairee is the commercial heart, main drag, and tourist central. Very busy and loud. Both of the freediving schools on Koh Tao are located along the main strip here. If you’re taking SCUBA diving lessons, they are probably near here. If you don’t plan to rent a motorbike in Koh Tao, then staying in this area is the most convenient spot. Chalok Baan Kao, or just: Chalok. Quieter than Sairee with many restaurants and hotels. Described well as a “Good place to stay if you want somewhere quiet but still near local conveniences” like shops and restaurants. You could probably spend an entire visit here and not have to visit Sairee, if you wanted. A motorbike would still be recommended. Aow Leuk was my favorite bay because of its picture-perfect views and excellent snorkeling. Relatively deep water with coral and underwater life immediately off the beach. I would go back, although I was irritated with the staff service at my hotel. Go here for swimming and watch the sun set! Freedom Beach was an excellent, picture-perfect spot to watch the sunset. I enjoyed swimming in the ocean here. It is the most popular small beach on Koh Tao, but also very quiet. I would go back here! Recommended. The only restaurant on Freedom Beach is very photo-friendly. The staff was not as nice. I paid 200 THB per day from a travel agent shop (RPG Travel) on Sairee’s main Walking Road. They requested my passport to be left as a deposit. Without a motorbike, my time on Koh Tao would have been much less fun and interesting. I highly suggest renting a motorbike and couldn’t imagine visiting Koh Tao again without one. I Love Salad, near Chalok. Well-run, clean, and great salads. The healthiest I ate during my entire time on Koh Tao. I’d go back in a heartbeat. 995 Roasted Duck, Sairee. Affordable street-side dining featuring duck. Friendly staff, and delicious duck dishes on rice, various types of noodles, soup, etc. Other options beyond duck (veg, chicken). Often crowded and a line at night. Closed 4-5:30pm for a break before dinner. Bang Burgers was a very good, very decent burger. They even did it as a lettuce wrap for me. I’d imagine other spots have good burgers. Aow Leuk II Bungalows, right on the beach in Aeo Leuk. Recommended, but note there is no A/C and the head of staff seemed inconvenienced and sometimes rude whenever I asked for anything (wifi password, and a late checkout). Bungalows are standalone units with incredible views into the bay. Each has two powerful fans, large bed, closet, etc. 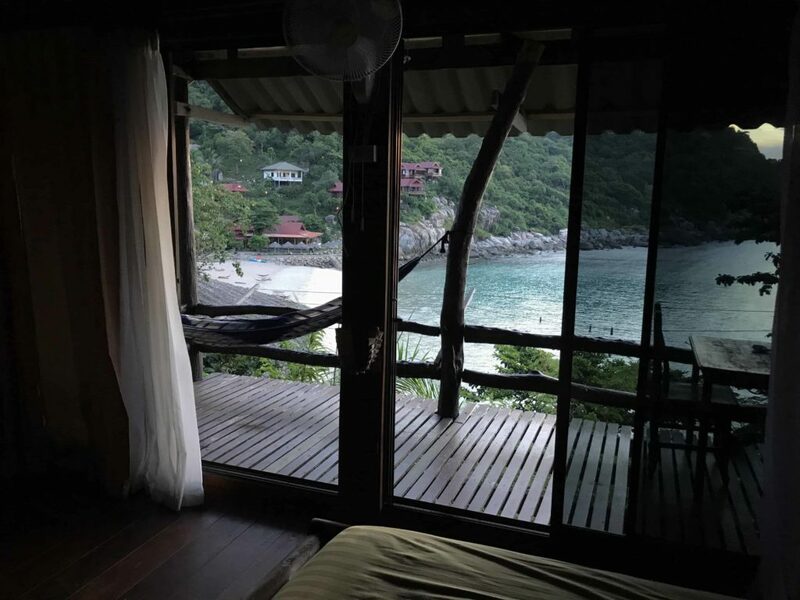 My favorite of all my rooms on Koh Tao. I think I paid 1500 THB for my room. Here’s where I stayed. It took a few minutes to walk to the beach. More hotels: There are much nicer hotels on the island, including many resorts in different areas with great restaurants. I had a mental block towards spending more than THB 1500 per night since I was diving all day and rarely in my room or on the property. JP Resort in Chalok was recommended to me by a few travelers taking the freediving class. Likely priced 600 THB fan room, 1100 THB a/c. It looked busy and clean when I drove by. Ban’s Avenue, next door to Indie Hostel on Walking Road in Sairee. Do not recommend due to extremely loud club music next door that easily reaches all rooms through paper-thin doors. Otherwise, excellent rooms and a great price (1000 TBH / night, with A/C and wifi and room with closet, desk, shower, kettle, etc). The music was so loud at 10pm that I could only laugh at how absurd the situation was. I considered abandoning the room to find other lodging, but eventually fell asleep. Kae Big Fish Resort, on the beach in Chalok. Do not recommend, but not terrible. My motorbike needed gas, so I stopped at their shop. Realizing how late it was, I inquired about lodging. They offered me a beachfront bungalow for 1100 THB including A/C. It and the onsite restaurant were just OK. I wasn’t impressed with the beach. I did an introductory course with Blue Immersion and I really enjoyed it. They were friendly, helpful, and challenged me in the water at just the right times. I’m glad that I went to Koh Tao. If I go back, I will look at nicer hotels in advance. I’ll know some good restaurants (I Love Salad), I’ll go to Freedom Beach and Aow Leuk, and I would probably hire a private boat taxi to take me around the island for private snorkeling. And I would definitely do more freediving classes.